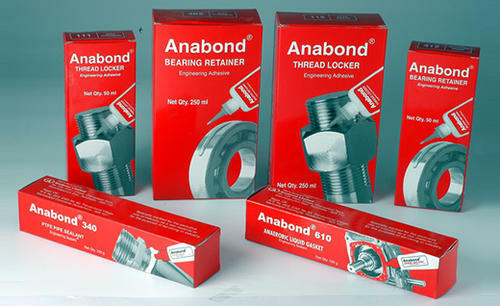 Anabond anaerobic thread locking adhesive is used to seal machinery fasteners against loosening due to vibrations. Transverse Shock vibration tests have proved beyond doubt that Anaerobic adhesives are the best solution to preven vibrational loosening. It also seals the threads and prevents corrosion between the threads..Being an acrylic adhesive the cured film inside the threads dampens vibration and ensure fail-safe assemblies. This type of Anabond adhesive is easy to use. It is cost effective and increases the efficiency of machines. Being a client oriented organization, we are manufacturing, trading and supplying a comprehensive range of Milling Machines and Machine Tools. The wide array of machines that we offer include Vertical Milling Machine and Horizontal Milling Machine. These machines are widely used in various industries and acknowledged for their performance and smooth functionality features. We also offer CNC Holders, Machining Tool Holder, Indexable Drills and Core Drilling Holders, Indexable Cutter, Cutting Tools and Automobile Reamers, which is fabricated using optimum quality raw materials in accordance with industry standards. Our company is supported with a team of highly qualified and dedicated professionals that help us in meeting the client's specific requirement. With the assistance of them, we also provide Testing Services to our clients as per their requirement. Furthermore, our R&D unit enable us in catering to the growing requirement of clients in a best possible manner.